Power for your life. Any time - any place. Guerrera and Sons Electric offers a full line of Briggs & Stratton Portable Generators. In addition to our full gambit of stand alone generator services we have smaller more economic options that can fit any budget or need. If a standby generator system is not a consideration, a portable generator can be a great option to help protect your family and possessions during a power outage. Portable generators are great for camping, on the job site or anywhere you need power. The best time to buy a generator is before you need one. Whether you need a backup for you home or you'd like to secure a power source for some back-woods adventuring - we have you covered! Our generator services and maintenance options make upkeep easy so you are always ready to go with your portable generator! Contact us for information on purchasing a portable unit, or the installation of a complete system. 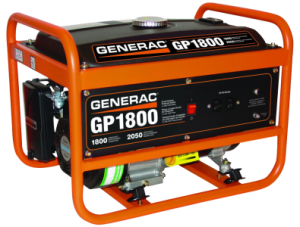 The convenience and utility of portable generators cant be over emphasized. Manageable size and minimal upkeep means portable generators put the power back in your hands! With hundreds of critical use scenarios (storms, power failures, recreation, onsite power needs, blackouts) this is one tool you are sure to use for years and years to come! Make sure to give us a ring and ask about the options you have for portable generator systems. Whether your hanging out at the house or roughing it in the back-woods these portable generators will keep you powered up. No matter what nature throws at you, you can rest easy knowing that you have a backup for your homes power - and the ability to keep critical appliances running. Never worry about long extension cords or a lack of power in remote work sites again! Want to take a break from the world and have yourself an adventure? Portable Generator Systems keep the lights on anywhere on earth!